This thread is for the discussion of "Little House on the Prairie". It was a pleasant house. A soft light came through the window holes, and every crack in the four walls glowed a little because the sun was overhead. I love the descriptions Laura/Rose gave when they wrote about the light of the sun and the moon. Here is a description of the house at night. Mary and Laura lay in their little bed on the ground inside the new house, and watched the sky through the window hole to the east. The edge of the big, bright moon glittered at the bottom of the window space, and Laura sat up. She looked at the great moon, sailing silently higher in the clear sky. Its light made silvery lines in all the cracks on that side of the house. The light poured through the window hole and made a square of soft radience on the floor. It was so bright that Laura saw Ma plainly when she lifted the quilt at the door and came in. I always marvel at the depth of Laura's description of the times and places in her life. By her tales, in my mind I can see them very vividly and imagine myself there with her. Me too, Misti. I think it's amazing how much she remembered, including little details. She was always so descriptive. How much of the story is left out on the tape? Is it all there or just an overview? I've considered buying the tapes but I don't want them if the story isn't all there, I guess that is what abriged means, huh? It's all there! There may be more than one kind though. We bought the ones with Cherry Jones reading- I think that's her name... They didn't have all the books the last time I looked though. Thanks for the info. I will have to check them out. I'm going to Mansfield in just over a month, I'll look for them when I'm there. 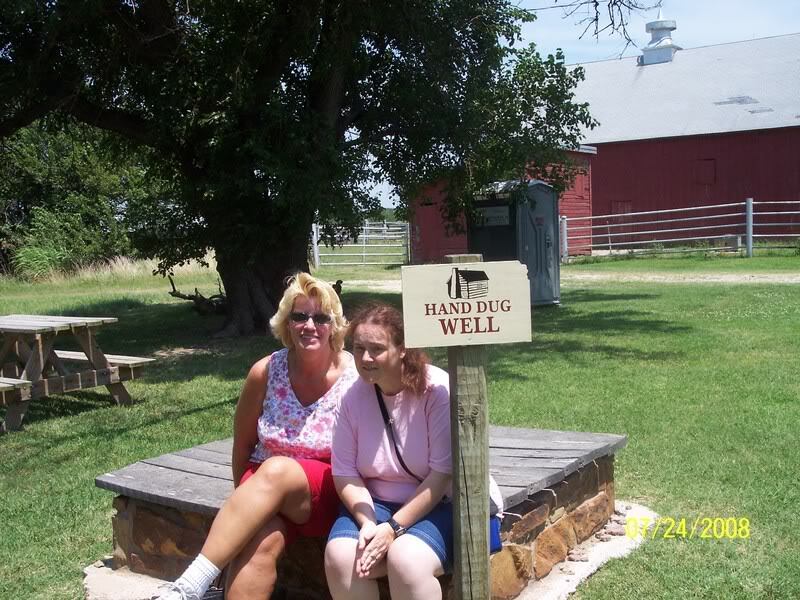 I'm going to the Ingalls site in KS next Thursday!!! I'll let you know all about my time there when I get back. We are also going to Mansflied on Friday, can't wait. Ha! I see you're on cloud nine, Marilyn! Yup, at the moment I'm on cloud 9, anticipating a wonderful week next week. I can't wait!! this book should get high praise! the televsion show was named after this book! 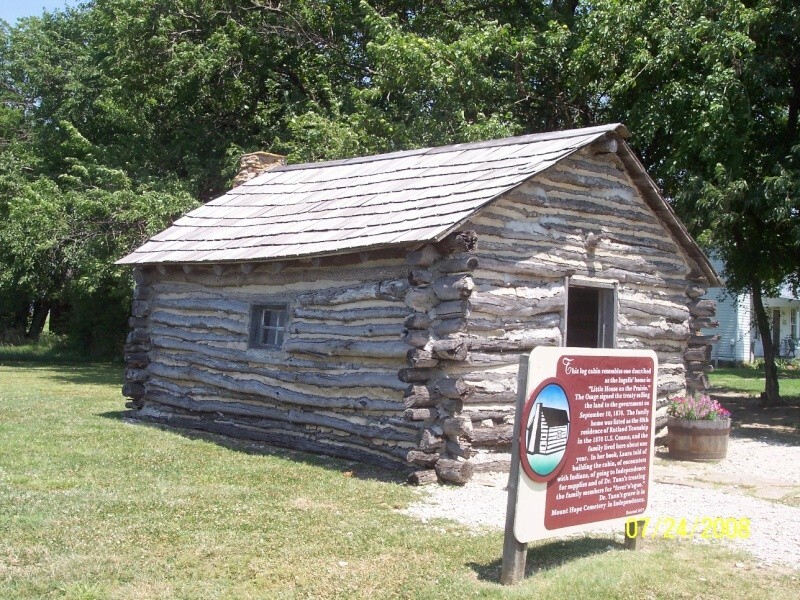 Here's a pic of the reconstructed house on the prairie near Independence, KS. It was so cool to see it and imagine a small Laura running in and out of the door. I have a shirt from there. I ordered it online. 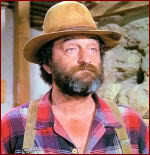 In Little House on the Prairie we read about Pa and Mr Scott digging a well. 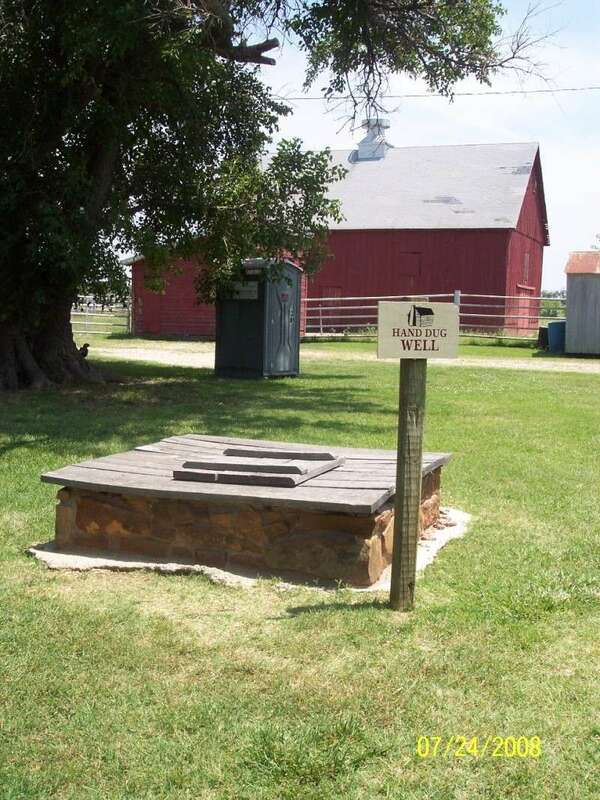 When the searchers were looking for the land on which the little house stood, they searched the records and found the area but were able to find the actual property due to the well. They knew that Pa had dug one and there it was. Kinda cool. We sure had fun didn't we Marilyn?? Yeah, too bad we couldn't have got a dipperful!! This is my second favorite book. The pictures are great.....can you imagine living in a house that small??? I'm re-reading Little House on the Prairie. In one chapter. Caroline told Charles, she want send a letter to the family. So, the letter can arrive in the winter time. When the family writes back. They will get the letter from their family until Spring time. See, how long it takes to get mail, then today's mail. Now, we have email, chat, facebook twitter, & etc...Takes seconds instead of months. Can you imagine if you email someone. The email takes long time, for them to receive your email. Vice versa. It's hard to chose only one...I think my favorite one is "The Long Winter" and close by" Little House in the Big Woods", but this one could be my third favorite. 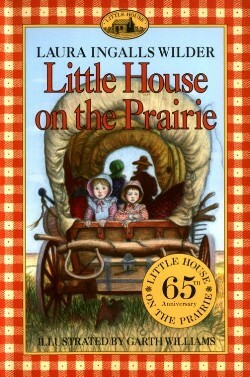 What was my very first "Little House Book"? The first one I ever read, because I found it in a book shop who selled books in all languages was Farmer Boy"...and I loved it! Subject: Re: "LITTLE HOUSE ON THE PRAIRIE"